Adam finished the new flowerbed, incredibly hard work. I planted a row of tulip bubls in red, pink, purple, red/white, and orange/yellow in the new bed. They were in great shape, so hopefully they’ll come up soon. 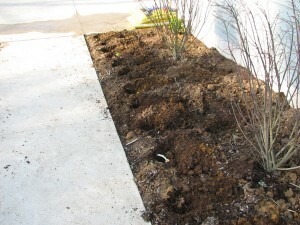 Our biggest conundrum was what to do with all the grassy soil Adam dug up making the flowerbed. Since we live by the shore our soil isn’t fantastic to begin with, but we couldn’t reuse that soil because it was full of grass. 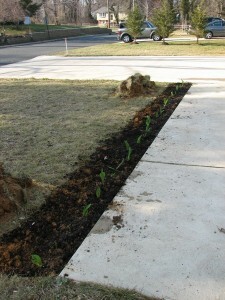 The last thing we want is grass growing in our flowerbed. So we replaced everything he dug up with dark, rich topsoil. But what do we do with the grassy soil? We bought a compost bin and started that in the backyard. We’ve put most of the grassy soil in there, but we don’t really know what kind of effect it will have. The grass will be great in there, but it was rooted so deeply that there’s a great deal of soil in there with it. We shall see. In the big flowerbed I planted dahlias and lilies, 2 shrubs, and a pot of pink heather. The dahlias I planted are incredibly cool yellow-white “Seattle” dahlias, and more than any other flowers I hope those come up. We got several colors of lilies, including red, yellow, orange, and Stargazer Oriental lilies. And now today we can hardly move. We’ve been texting and calling each other all day to one-up who is in the most pain after our vigorous day of planting. But I’m glad we did it, we had a gorgeous afternoon of warm sunshine in between horrid thunderstorms and downpours. So we got everything in the ground, showered, and were having cocktails by the time it started raining again. Fabulous!